I was challenged by this multinational company to provide an easy way for business owners and analysts to specify the requirements of new Intranet Sites and a way that promoted re-use, consistency and usability. I decided a simple wireframing toolkit would work best and developed the standard widgets users could drag and drop to create web-page layouts. This was received very positively however initial testing revealed the target audiences needed support before they started the wireframe process. They needed help defining functional requirements, how to run project meetings, how to define target users (personas) and their needs (user stories). As a result I developed a selection of checklists that users could follow to document and manage requirements before moving onto wireframes. All of this including the “Getting Started” Storyboard were included in the Powerpoint file. This meant the toolkit was self-documenting as well as providing everything necessary to document requirements, wireframe and manage small to medium sized Sharepoint design projects. 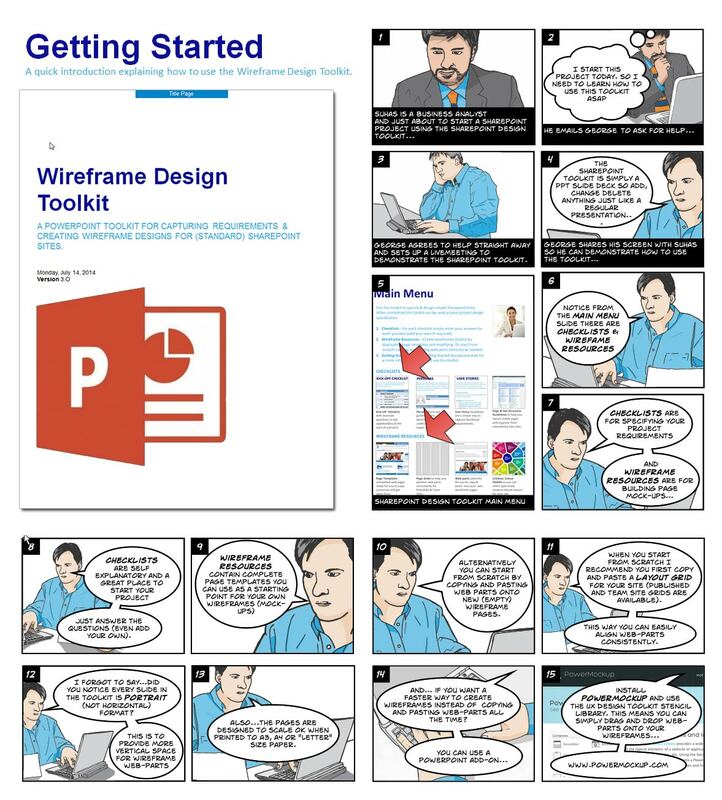 This “Getting Started” storyboard is published on slides inside the Powerpoint toolkit. The format makes it much easier to read, understand and remember. It’s a fictitious interview with a consultant who explains how to use the toolkit. This was a huge success and continues to be used extensively for small to medium projects across the entire company. No training is required as the toolkit is self-documenting. Most small to medium sized Sharepoint Design Projects use this toolkit and has become defato governance for many projects. I often received requirements for more complex UX projects built using the Powerpoint Toolkit ready for me to prototype in Axure. Although most simple projects go straight from the Powerpoint Toolkit to development.